DIY FaQ - All your answers in one big post - Miata Turbo Forum - Boost cars, acquire cats. Now...before starting anything, read “Maximum Boost” by Corky Bell. Once you do go buy an Engine Management. There are actually three ways to reduce the probability of knock at full load on a turbocharged engine: reduce boost, adjust the AFR to richer mixture, and retard ignition timing. These three parameters need to be optimized together to yield the highest reliable power. What is knock? The killer of engines. Without any sort of ignition control the recommended safe static timing is 6° (8° with an intercooler). And this is only, only if no ping is present. This will rob you of low-end torque and generally lower your HP/TQ curves. The Bipes ACU (Auxiliary Control Unit) dynamically retards the timing of your engine to protect it from detonation or knock. The ACU uses three input parameters to control the timing: Airflow, RPM, and Intake Temperature. You can pull a total of 14° of timing. Not only will you help protect against detonation, or you gain low-end power back if you keep your static timing at 10* or advanced. The Bipes is a proven device in NA, turbo and supercharged Miatas. Aftermarket ECU and “piggyback” usually have this function built in. Another option is the MSD Boost Control unit specifically designed for the Miata. The Bipes actually originated as a mod for this unit for added adjustability. They can still be had, but usually for the same price tag as the Bipes itself. The MSD unit retards the timing 3° per pound of boost pressure with no more that 6° of retard being allowed. When no boost pressure is present, the ignition runs at the factory timing. These settings are fixed and cannot be adjusted. With that said, you can still run your Miata advanced to 14° of timing and when it boost it will retard back to a safe 8°. If knock is still present then set your back back a little. It's a little basic but it gets the job done. The third, and in my opinion the best, option is going with a piggyback or standalone ECU unit. These units give you full control over the entire spark map; based on load and rpm. Last edited by Braineack; 10-31-2006 at 03:05 PM. An APFR or FMU are ideal alternatives to expensive ECU modifications. This is accomplished by using the manifold vacuum/pressure to drive the fuel pressure up as the boost rises. The BEGi standard rising-rate regulators are designed to increase fuel pressure and fuel flow in a fuel injection system by augmenting the factory fuel pressure regulator. These regulators must be used in conjunction with a factory regulator, which provides the base fuel pressure (the fuel pressure at fuel rail during idle conditions). The amount of fuel pressure rise can be adjusted by adjusting a screw on the side of the unit. The Vortech FMU (standard on the GReddy kit) works in the same principal however the amount of fuel pressure rise is determined by a disc and cannot be changed on the fly. Recalibration kits can be bought for cheap however they require the disassembly of the unit to change the ratio. So with a ratio of 10:1 (10psi of fuel for every 1psi of boost) you can supply 100psi of fuel to your injectors when boosting 5psi. If you don’t plan on adjusting your boost levels often the simple static disc FMU unit can be had for cheaper than an adjustable unit. However, with the added benefit of being able to easily supply your injectors with the right amount of fuel by the turn of screw adjustments they are worth the extra cost. -Note- Larger injectors, Intercooler, etc., can change the desired fuel levels. Hoever, most do not recommend over 100-110psi of fuel at the rail in boost. *At this point it's time to think about larger injectors that can handle higher HP ratings at 100psi of fuel in the rail. The stock ecu can handle a -+ 20-30% injector. So the fueling with the stock ecu can only go so far. If you feel you're going to breach this point, then EMS should be considered. 99-01 RETURNLESS OWNERS LOOK HERE! You too can run an FMU setup to increase the fueling capacity of your injectors on a DIY or budget setup. Although you'll need an inline fuel pump, and of course the FMU. Basically, you plumb the FMU between the existing pump and fuel rail. Then loop the FMU around the inline, so the inlet of the FMU branches off from the fuel line after the inline pump and the return of the FMU branches off just before the inline. What happens is, when you increase boost and the FMU clamps down, some of the fuel gets blocked off and thus the inline increases the fuel pressure. Corky Bell also does this, i think in a similar fashion, but everything is done in the engine bay, so this make a simple DIY project to safely fuel a few pounds of boost. You do not need to bother with increasing fuel pressure when running engine management. Since you are in full control, you simply need to add larger injectors (which you can now control) and utilize the stock fuel pressure regulator. The money saved on the FMU is money spent on injectors that can support your goals. The 1.6L (230cc) fuel injectors have enough room to run about 5-6psi. However at this level, the fuel pressure required to get enough fuel into the motor through the small injectors becomes so great, that the injectors can actually lock. If you are running more than 140-150rwhp, chances are the injectors are maxed out. A very common upgrade is to install the 1.8L injectors. These will should provide you enough room to run about 7-9psi of boost (170-180rwhp). The 99+ injectors are made to run at higher fuel pressure (60psi) and tend to have a better spray pattern. Ideally you want to be able to run larger injectors at a lower fuel pressure, however, without additional fuel management this is not possible. The stock ECU has some wiggle room to run a larger injector, it usually requires tuning with the AFM to idle. The 1.6 ECU should be able to idle up to 330cc injectors. However it will require tweaking the AFM idle-mixture settings and spring tension. 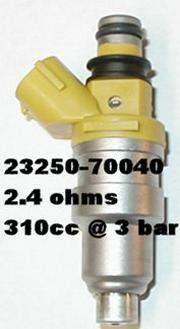 The common injector used with EMS users are the Rx7 460cc and 550cc injectors. The 460s should be able to support around 250rwhp, the 550s around 300rwhp. If you are using a “piggyback” fuel management unit such as the E-manage, the popular injector to use is a 305cc injector from the Supra. If you are using a replacement ECU the popular choice are EV14 550cc injectors. 89-91     B2220 Truck              224cc - Yellow Top? #23250-74040? Last edited by Braineack; 08-08-2011 at 07:35 AM. The stock Miata fuel pump can only provide so much fuel (tends to max out around 85psi). And we have already discussed the potential of higher fuel pressures versus higher horsepower. So you need to upgrade the pump if you plan to fuel past 70-80psi; usualy due to running small injectors on an FMU setup. Raising the fuel pressure raises the size of the injectors. Since it requires an aftermarket fueling device to control +20/30% larger injectors, adding more fuel pressure is the logical solution. Other than that, you don't need one. If you have an aftermarket ECU, the stock pump more than enough to support 300rwhp with the stock regulator. Changing the fuel pump does nothing but flow enough fuel...it doesn't change any other factors in the fuel entering the combustion chamber. Turn your Miata to ON but do not start it. Open the diagnositics box and put a paperclip on F/P and GND. That will run your fuel pump. With a pair of pliers, squeeze the fuel line shut that connects the FPR to the original fuel pressure regulator. When squeezed shut, the pump will be forced to maximum output. Make sure the pressure available is consistent with your intentions. In all cases, the pressure must show, in this idle test, to be about 10 psi higher than the desired fuel pressure, as the available pressure under real load conditions will be less than that measured at idle. This test does not actually prove the pump to be adequate under boost, but if it doesn’t pass this test, it is certainly a waste of time to continue with the same pump. Once you determine how much fuel pressure you are capable of you can determine if you need to upgrade or not. But as a rule, if you need to supply more than 85psi of fuel, chances are you need to upgrade the fuel pump. Fuel pumps are rated in LPH. LPH as in the 190 or 255 means “Liters Per Hour” and not fuel pressure available. For most boost levels discussed here in this forum, the stock pump supplies enough LPH, just not enough fuel pressure. The maximum pressure available from the stock fuel pump was between 78 to 85 PSI. That should be sufficient to run the 5-6psi of boost level. The most popular model is a direct replacement of the in-tank OEM fuel pump. But keep in mind an overly large fuel pump is not always the way to go. For the longest time the Walbro 255 lb/h fuel pump had been the accepted pump for FI Miatas. The 255 flows more fuel at any giving pressure level than is needed. They tend to overload the OEM FPR and cause the system to run rich even in vacuum. Instead of idling at 35psi and reaching 50psi at 0~hg. It will run closer to 40psi at idle and 55psi at 0~hg. Regardless, there are still a few options in fuel pumps. The ideal pump is the Walbro 190 lb/h HP fuel pump. HP stands for high pressure. It is important you get a HP unit if you plan on raising the fuel pressure levels past 90psi. The HP models can supply fuel up to 130psi. The standard 190 lb/h fuel pump is maxed at 90psi and the standard 255 lb/h pump is maxed at 80psi. The 190 HP unit will not only supply four 700cc injectors with enough flow to maintain 40-50psi in the fuel rail (enough for 400hp), but out flows the 255 HP model after 100psi. Another option is the Pierburg auxiliary fuel pump. This pump is capable of producing in excess of 140 PSI of fuel pressure. (Systems the require more than 120psi of fuel on boost may need to consider fuel management). It does not replace your OEM fuel pump but in conjunction with it. Instead of replacing your existing fuel but, this works inconjuction with it. Below is a comparison of fuel pump flow rates. It is easy to see how to 255 provides enough fuel for an F-15. The 190HP acts very close to a stock pump with more headroom for higher pressure systems. Multiple that by .80 (duty cycle) and divide by .55 (BFSC) and see how much B.H.P. the pump is capable of flowing for. Your ECU will always try to keep your Air/Fuel ratio at 14.7 when in a closed loop. Typically anytime below 3.5-4k or when traveling up steep inclines the ECU will be in a closed loop. This causes a hesitation or stumble when travel back and forth between vacuum and boost. The reason being the ECU wants to see 14.7 while your APFR is dumping in excess fuel at the same time. An easy (a few wires) and safe (no lean tip-in when entering boost) solution is an o2 clamp. 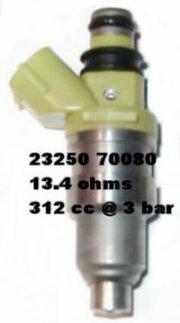 Typically they use a pressure switch that is connected into a vacuum line. When the switch sees a certain amount of boost (usually .5psi), they trigger the o2 clamp to trick the ECU into thinking that no extra fuel is being added. This will ensure that all your added fuel will be there when demanded upon and you will get rid of the stumble. Last edited by Braineack; 10-30-2006 at 07:19 PM. A Wastegates provides us a means to control the boost pressure of the engine. There are two configurations of Wastegates, internal or external. Both internal and external Wastegates provide a means to bypass exhaust flow from the turbine wheel. Bypassing this energy (e.g. exhaust flow) reduces the power driving the turbine wheel to match the power required for a given boost level. Similar to the BOV, the Wastegates uses boost pressure and spring force to regulate the flow bypassing the turbine. Internal Wastegates are built into the turbine housing and consist of a “flapper” valve, crank arm, rod end, and pneumatic actuator. It is important to connect this actuator only to boost pressure. External Wastegates are added to the exhaust plumbing on the exhaust manifold. The advantage of external Wastegates is that the bypassed flow can be reintroduced into the exhaust stream further downstream of the turbine. This tends to improve the turbine’s performance. On racing applications, this Wastegated exhaust flow can be vented directly to atmosphere. In order to run more than this level of boost on you will need to have some means of controlling the boost level. Not only can you achieve higher boost levels, but by keeping the wastegate closed as long as possible, you will cause faster spooling. The wastegate arm (internal) holds a valve shut until it sees boost. Once boost enters the wastegate actuator it slowly opens the valve until the boost level peaks. Keeping the valve closed the longest amount of time possible will allow the exhaust to spin the turbine faster, instead of being released into the exhaust. Manual boost controllers can be had for as little as $15 to as much as $200. They are simple a ball and spring device**. The boost enters the MBC and pushes up on the ball which pushes on the spring. The ball will rise and eventually allow boost to enter the wastegate actuator. They can be adjusted by simply adding or removing tension on the spring. Entry level Electronic boost controllers are now coming available on the market. These have built in MAP sensors and control a sileneoid. Install is simple; Boost can be adjusted on the fly, and you'll impress all your friends. Price tag can be anywhere from $250-600 bucks depending on the unit. Last edited by Braineack; 10-31-2006 at 03:20 PM. If you are going to run higher than 6psi you typically need to have some type of intercooler. The more you increase the boost, the hotter your intake temperatures get. The hotter the temperatures get, the more prone to detonation and knock you are. According to the Ideal Gas Law (PV = nRT) anytime a gas is compressed, its temperature rises. Let's say at 10 psi your turbo produces about 180F delta increase of the temperature. This means if you have 90F ambient (at the air filter), at 10 psi you'll get about 270F at the turbo outlet. Since the temp goes up about 180F over ambient. If a 67% effective (poor) IC were present, the charge temp would drop about 120F. The size of the IC or pipes has absolutely nothing to do with throttle response, or boost response. If you can calculate how long it takes for X amount of CFM to fill the volume in the intercooler, then you're thinking too hard. The flow is so great relative to the volume of the intercooler and pipe and distance involved in whatever sort of plumbing you utilize that these factors have virtually zero influence. Larger ICs do have greater pressure drops. If a 2psi drop exists, then the turbo is pushing 14psi, but only 12psi exits. This can effect spool time simply because the extra 2psi you need to add might take just those extra few RPMs to reach. The longer the tubes in the core, the greater the effectiveness. However, The heat rejection tapers off with longer and longer tubes. For example, 25" long runners calculate, and measure, to be about as efficient as one can get... near 96/97%. Suppose you double the tube length, you may or may not be able to get that extra 3 or 4%. The limit of an excellent intercooler lies between 18 and 24 inches. The second factor is the internal flow area of the core. The more area, the less the pressure loss in getting the air charge through the core. The measure of proper intercooling clearly lies with the ability to remove heat and not lose boost in the process. Match the intercooler size to the engine's airflow for the most efficient system. Too big of an intercooler wastes your money...the efficiency increase of utilizing runners longer than 18-20" is minimal at best. Keep pressure drops across the core to a minimum, 1.5 psi at full boost max. Quality can make up for size. A better conducting cooling medium, such as aluminum, will increase the drop in temperature. Mount the intercooler so it can get the most air that passes over the fins. Seal the intercooler and direct the airflow to increase efficiency. #1: the intercooler heats the airflow to the radiator...if you fill the entire mouth, the radiator will not work as effiecent, so you my have awesome air intake temps, but your water temps & cooling system could be compromised. try to get as much airflow to both the IC and radiator, so seal the top area by the hood-latch, try a scooper from below and block the sides of the mouth so air is forced to pass through either one. With all that said, I'd go for an intercooler that didn't fully block the radiator (or had provisions to scavenge airflow from below directly onto the radiator), had somewhere around a 18-24" long core, and had enough internal airflow to support your given HP range. Don't forget about water injection. This utilizes a fine mist of water into the charge dramatically reducing intake temps, most times with +100% effiency. This means you can run greatly advanced with reduced exhaust gas temperatures and less demands on fueling. If instead of the richer mixture, about 10% (by mass) of water would be injected in the intake charge (0.008 kg Water/kg air), the high latent heat of the water would cool the charge by 18 degrees; about 4 times the cooling effect of the just a richer fuel mixture. The added fuel for the rich mixture can't burn because there is just not enough oxygen available. So it does not matter if fuel or water is added. Last edited by Braineack; 06-21-2007 at 08:47 AM. The Blow-Off valve (BOV) is a pressure relief device on the intake tract to prevent the turbo’s compressor from going into surge. This is caused by the pressure wave from the turbo smacking against the closed throttle plate when you shift, or let off the gas after a boosted run. Compressor surge creates rapidly cycling pressure fluctuations, most times audible. Surge can eventually lead to thrust bearing failure due to the high loads associated with it. Blow-Off valves use a combination of manifold pressure signal and spring force to detect when the throttle is closed. When the throttle is closed rapidly, the BOV vents boost in the intake tract or atmosphere to relieve the pressure; helping to eliminate surge. After 4-5psi turbos will start to suffer from compressor surge with the lack of a BOV. If you are using the stock ECU, you have few options. One preferred option that is guaranteed to work is a bypass valve installed near the throttle body with the air vented back into the intake after the air flow meter. This way all the air metered from the AFM or MAF stay in the system and cannot cause a vacuum leak. If you are determined to run your BOV VTA (vented to atmosphere) you must install a check valve on the open end to prevent leaks at idle. A few websites sell these devices. Without this, you have created a very large vacuum leak and the ECU will not be able to compensate for it, result: bad or no idle. Another reason that this is not prefered is that the Miata uses and AFM or MAF to meter the air into the engine. Any air that enters/exits will alter the ECUs reading and potentially cause overly rich condition between shifts (loss of air) and lean conditions at idle (entering unmetered air). In this case it is wise to choose function over form. Another option is to install an sequential blow off valve. A SSBOV vents the air out into the atmosphere, but unlike most blow off valves it (shouldn't) does not leak at idle. Again the BOV is case where an aftermarket ECU can change the statements above. Most Stand-Alone units use a MAP sensor instead of an airflow meter. Venting BOVs doesn’t tend to bother these units. Last edited by Braineack; 10-31-2006 at 03:15 PM. If you're going to run over 6psi, chances are the OEM clutch will start to slip. A clutch rated at 200 ft lbs. of torque should be able to hold to around 9-12psi. A clutch rated at 260 ft lbs. of torque should hold against everything you throw at it, within reason. There are a number of manufacturers that sell clutch kits. Typically a kit includes the Pressure Plate, Clutch Disc, Throw-out Bearing and Pilot Bearing. You’ll want to replace all of these when upgrading your clutch. Surfacing/replacing/light-weighting your flywheel would also be beneficial at this time while it can be removed. 1.6L Miatas can upgrade to the 1.8L clutch when coupled with a 1.8L flywheel. Last edited by Braineack; 11-28-2006 at 12:54 PM. The primary function of a vehicle's exhaust system is to muffle the sound coming out from the exhaust port of the cylinder head and to direct the exhaust gas out the back of the vehicle. The objective of a properly-engineered turbo exhaust system is to provide additional performance while still delivering adequate sound control. Unlike an all-motor exhaust system, a turbo exhaust system suffers no ill effects from going as big as possible. Essentially on a turbocharged vehicle, the turbine section acts as a very effective muffler. The larger diameter exhaust pipes allow the back pressure to be significantly less than the factory exhausts system. As a result, the difference in exhaust pressure before and after the turbocharger is increased. The increase in the magnitude of the pressure difference allows the turbocharger to reach higher shaft speeds at lower engine operating rpms. As a result, boost response increases and boost pressures increase. More boost pressure at the intake manifold results more power at the wheels. At least a full 2.5” exhaust system makes a turboed Miata breathe very easily. The first part of a turbo exhaust system is the downpipe. This replaces the exhaust pipe pre-catalytic converter. Downpipes help dramatically to improve exhaust flow and improve turbo spool up. They can also lower the engine-bay temperature when using stainless steel as opposed to mild steel which gives off more heat. Heat contained within the turbo system will increase power, while heat escaping to the engine bay will raise intake temps and reduce power. Next is the catalytic converter which must be retained if you plan on passing emissions. This is usually one of the more restrictive parts of an exhaust, since the exhaust must pass through the catalysis. If you want to improve your exhaust flow you’ll want to use a high-flow cat. High-Flow Cats usually have 200-300 honeycomb style catalysis that a relatively free flow through your car's exhaust system all while passing emissions. A free flow catback exhaust system does wonders to help a turbo Miata breathe. The second biggest restrictor on the exhaust system is the muffler. A free-flowing muffler actually has a perforated internal core wrapped in the sound dampening material. Since the internal core itself is straight through, the muffler is not a restriction. The turbo itself acts like a damper on the exhaust pulses so it is possible to run a very free flow muffler without being overly loud. In fact a catback exhaust on a turbo Miata that was designed for a non-turbo Miata will most likely be a quite as stock. And likewise, a turbo exhaust on a non-turbo Miata will have virtually no sound dampening. A number of 2.5” Stainless Steel Turbo Catbacks are on the market today. In other words, get a DP that matches your turbine exit. Taper it out to 3" all the way to the tailpipe and enjoy all the added efficiency. Because of the position of the turbo, it is very important to shield components of the engine bay from the intense heat. Your master cylinder reservoir as well as brake & water lines sit right next to the downpipe. They have been number of cases where the reservoir has melted and resulted in brake failure. A number of turbine blankets and shields are available for all types of turbos. Not only do these block most of the heat from radiating out into your intake, brake lines, coolant, etc., they help keep the heat focused in the turbine and may increase the turbine’s efficiency. Since a lot of the important lines run near the turbo and manifold as well it is important to keep them proected against the heat as well. It is wise to wrap you water lines (two off the firewall), oil feed, oil return, brake lines, lower radiator hose (off the block) and dipstick pipe in heat wrap. Heat wrap can be purchased from numerous vendors in different temperature ratings, shapes and sizes. As well as different mounting solutions, i.e, adhesive backed, wire wraped, rivted, etc. A roll of 1.5”x15’ 2000° adhesive backed heat wrap can be purchased for under $20. This is enough to wrap all your vital lines with room to spare. Wrapping the downpipe to reduce underhood heat will prove useless. 80% of the downpipe is under the car, not under the hood. The material of the downpipe will deteriorate very rapidly if insulated. If your downpipe is mild steel, I'd suggest it will not survive more than 2000 miles. Stainless, maybe 5000. It will actually "flake" away and break into pieces. However, it is always useful to get more air flow under hood. It is the incoming air flow that pushes all the hot air out. Devices like NACA ducts, TSIs (Turn Signal Intakes) and scoops & louvers allow direct airflow into the engine bay. Extractor hoods can also be used as a way to help the hot air escape better. Last edited by Braineack; 10-31-2006 at 03:42 PM. 1.6L and early 1.8L engines have a preexisting location for the oil supply. It is located on the driver side of the block near the dipstick port. The correct size fitting to match up to it is a M10 x 1.5. Based on previous issues locating a correct fitting, you'll want to source a M10 x 1.5 to -4AN fitting. -3AN adapters are nearly impossible to find. You'll plain have better luck source -4AN lines and fittings and save yourself a roadblock. Stainless Steel lines must be used for the oil feed. 1.8L engine that do not have feed bung need to either tee off the pressure sender on the opposite side of the block (next to the oil filter) or use a sandwich plate on the oil filter with a port for a fitting. Also determine whether or not your turbo will require a restrictor on the line as well. Some turbo have a built in restrictor and others tend to need a .060" restrictor fitting just before the turbo. The return line is simple; Drill and tap your pan. Although the 1.6 block has an oil return port next to the oil filter using it may make your life easier, but in the long run it can make you rip out your hair. The oil outlet should be plumbed to the oil pan above the oil level. Since the oil drain is gravity fed, it is important that the oil outlet points downward, and that the drain tube does not become horizontal or go “uphill” at any point. If it does chances are you'll run into oil burning problems. Added to fact that you have about 5' of return line you'll have to source and route. The procedure for drilling and tapping the pan is rather straight-forward and well covered in the turbo Miata community. A 1/2" NPT to 5/8" Slip on fitting is typically used when using a high temperature silicone return hose. Or a 1/2" NPT to -10AN fitting would be used if using stainless steel lines. tapped Oil Return Location Careful, oil pickup is directly behind the location. 1.6 owners beware. The 1.6 rear end is only 6" ring-gear. Open or Viscous LSD. They are known to fail on stock power delivery. They can blow without warning or last a lifetime. There is really no definitive power level where they will fail. But one way to help prevent it is to show mechanically empathy (i.e. no clutch dumps or drifting). A number of higher powered Miatas have lasted over 20k on them, others longer, some a lot less. Does this mean you should replace it? Up to you, but to play it safe you should plan on it. But if you do decide to there is still $$$ to be had from ditching the 1.6 rear end to offset costs. What do you replace it with? The 1.8 rear end of course! Both the Open and Torsen LSD utilize 7" ring-gaers, and have been recorded to handling abuse at power levels exceeding 250-300rwhp. The swap is fairly simple, and it requires only the 1.8 rear assembly, half-shafts & stubs, and driveshaft. There are various end gears availble from different year miatas. The 1.6 rear is geared at 4.30:1, so if you're looking for a bit more top-end try to find a 4.10, 3.909, or 3.636 unit. You'll find 1st gear much more easier to handle and a significant drop in rpms in 5th gear. The 3.909 came on the 99+ 6-speed Miata. The 3.636:1 came on the 2001+ Austrailan 6-speed. 86-91 RX7 Non-Turbo Clutch Type LSDs can also fit into the 1.8 gear ring if you're looking for a good LSD as well. Clutch-types have proven superior in Drag and Road course situations as the lock under driveshaft torque, whereas a Torsen should prove better in an autox situation as it locks only when one wheel loses torque...so in the middle of corners. Open the 1.8 miata & pull the open diff. Decide what ring and pinon to use (easier to use the miata gearing, costs more $$$ when having a shop set both the pinon depth and backlash). Bolt the correct ring gear to the RX7 LSD. Drop it in, set the backlash (and pinon depth if swapping pinon gear), and reassemble the housing. Swap/install as normal. Open the RX7 assembly. Decide what ring and pinon to use. Bolt the correct ring gear to the RX7 LSD. Swap the pinon gear and lsd guts to the miata pinon housing. Set the backlash (and pinon depth if swapping pinon gear), and assemble the miata pinon housing to the RX7 housing. Drill out the RX7 diff bushings and push in miata specfic bushings. Install as normal. **note: The 89-91 Non-Turbo LSD will also fit, but shy away from these are they are Viscous LSD units and aren't worth the trouble. Run you water lines off these two locations. It doesn't matter which is in or out. A narrowband o2 sensor outputs 14.7:1 as .85-.20volts. Since the ECU idles at 14.7:1 AFR it makes small adjustments to make sure the voltage is within that range. Hooked up to a gauge you will see iot sweeping back and forth as those adjustments being made, bouncing to each voltage and back to the opposite. Since it's such a wide range. The wideband o2 sensor outputs the o2 readings in the exhaust on a linear scale, so at each voltage increment, it represent a new AFR, when outputted to a gauge, you can see exactly the correct mixture of o2 in the exhaust. Last edited by Philip; 08-04-2007 at 11:41 PM. Last edited by Philip; 08-04-2007 at 11:40 PM.